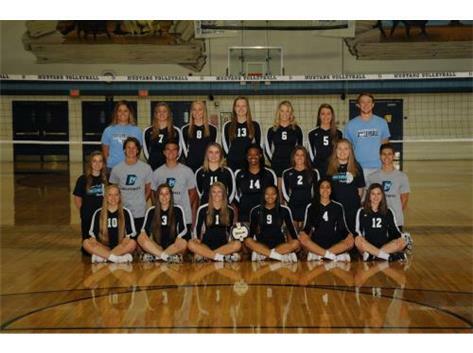 The 2018-2019 Mustang Volleyball Program has high hopes for a strong 2018-2019 season. Last season, the team finished slightly above .500 but the Mustangs have been putting in the work to excel beyond that this year. The Mustangs are led by Head Coach Kristee Conrad and Assistant Coach Ryan Altenburg. Three-year varsity players and All-Conference athletes Lucy Dumford (Senior, 6'0") and Addy Karmik (Junior, 5'9") will allow their experience to lead the pack offensively for the Mustangs. Middles Rose Dumford (Junior, 5'11) and Jess Juerke (Junior, 5'11) will return as starters in year two and diversify our front row. A new varsity force expected to make a strong offensive debut is Outside Hitter Alyssa Fountain (Sophomore, 5'10"). Seniors Abby Valliere and Grace Lamoreaux also will contribute offensively for the Mustangs. On the defensive end, Sarah Reilly begins her senior season with significant varsity play time in 2017-2018. Younger contributors like Holly Kaczmarek and Morgan Rau are also expected to fight for the libero position. Setter Alyssa Mojica adds to the depth in this position as well. Coach Conrad is extremely optimistic in her first season as varsity head coach, as she feels the girls have put in the necessary work in the off-season and are continuing to create a culture in the gym where anything other than hard work is not tolerated. Coach says, "This is an exciting team to coach because these girls are athletes that are diverse. They are able to play multiple positions on the court which opens up doors for creative game plans, based on the opposing team. When every one of your pin hitters has experience in the middle, it leads to a fast offense that it challenging to beat." The Mustangs kick off their season on Friday, August 24th at the Plainfield North Invite.